Managing office space is challenging. With limited area and increasing requirements to accommodate computer/ laptops along with storage spaces, you look forward to some quick ways to plan your office desk. Offices these days have a unique set of requirements and there’s no such thing like – one size fits all. As a result, people find it difficult to select office desks and L-shaped desks, all the more. So here are some ways to go about office desks. Straight office desks were earlier designed without computer workstations and offered relatively lesser space. But with technological advancements and its adaptability in office workspaces now need computers, desktops or laptops. L-shaped desks are typically designed with computers in mind, providing space for computer along with space for other desk-related work. 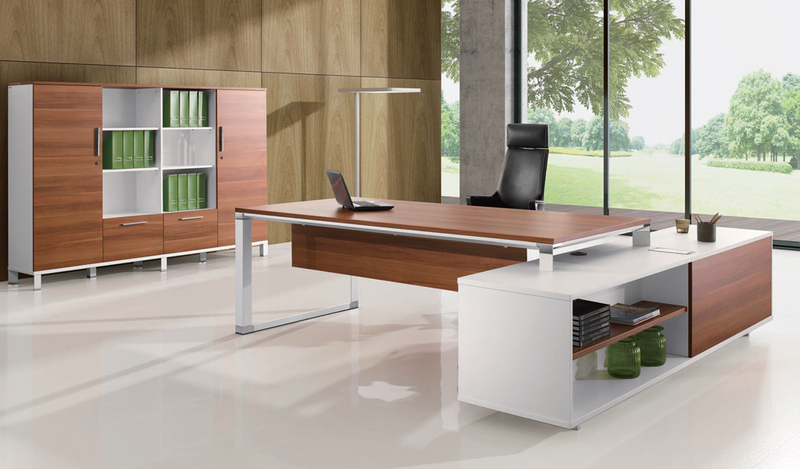 Such desks provide flexibility to create a productive and comfortable workspace. Selecting an L-shaped office desk requires analysis of employee’s tasks and responsibilities like – Will they be dealing with a large amount of paperwork? What kind of technology enabled products shall be required? This may include desktops, monitors, printers, scanners and telephone. All these need space as well as power supply cords. The power cords can be messy unless properly hidden away. In such cases, select desks with wire management systems, strategic desk placement to help you deal with such distractions. At Boss’s Cabin, we make sure to provide these options in our range of L-Shaped office desks. Strategic placement of the office desk is yet another crucial factor while selecting furniture desks. The office layout, architectural structures like columns, windows and doors affect the furniture placement. So be clear of the office layout, space, organization, and proximity of employees before you choose office desks. Club employees with similar job duties to help create a productive environment. So go for an arrangement which encourages camaraderie. Color for long has been considered to be a lesser important factor while selecting a furniture. But apparently, it affects productivity at work. According to a color psychologist Angela Wright, individuals might have certain preferences for color, but the effect of shades influence universally. According to the Wright’s theory, blue stimulates the mind, while yellow inspires creativity, red affects body and green maintain a calming balance. All in all, bright colors stimulate and soft shades have a soothing effect. Hence opt for shades in furniture that boosts productivity, motivation and employee morale. Personal preferences play a detrimental role in the selection of office furniture. Apart from colors, the design, functionality and other preferences like standing desks must also be accommodated while planning office desks. Desks with adjustable height, standing desks are becoming a popular option now. Such options support ergonomics. Apart from these a consideration of storage preferences in stackable panels, shelves, cabinets can help in selecting the office furniture better. L-shaped desks have an edge over I-shaped desks for many reasons. One of the prominent reasons is availability of abundant storage space. The shelves, drawers can let you do away with requirements of buying an additional storage space. So before you select a desk, make sure to review all your storage requirements and then decide on most suitable one. Employees spend a major part of the day in office. That makes it important to keep the furniture comfortable, organized and pleasing to provide a conducive working environment. The above factors ensure you select the most suitable office desks and keep your employees satisfied. 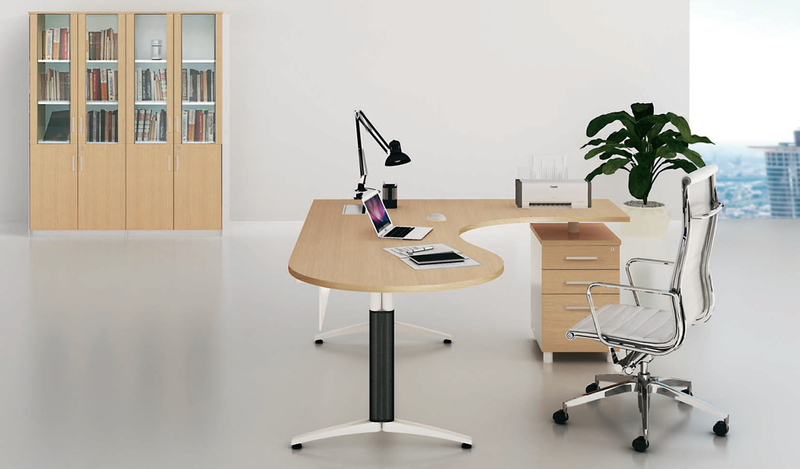 Need ergonomic accessories or other furniture to complement your new L-shaped office desk? Boss’s Cabin can help you provide one.